Odegaard Undergraduate Library Renovation, June 18, 2012, to June 24, 2013. 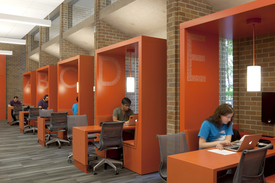 The library's renovation architects were recently awarded the 2014 American Institute of Architects' Institute Honor Awards for Interior Architecture. The $16.575 million project was funded by the State of Washington. The design team from Miller Hull Partnership, in conjunction with Mortenson Construction, is worked closely with the University Libraries and the UW Capital Projects Office to create student spaces for quiet study and group work, two active learning classrooms, a technology studio, an innovative writing and research center, and new staff offices. Key elements are improved lighting, a new and spacious atrium, an energy-efficient vestibule, data diner styled study booths extending from the windows, and a glass wall overlooking the atrium on the third floor. 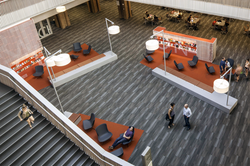 In addition to the State funding highlighted above, the library received a $139,719 Student Technology Fee award to equip the building's new collaborative spaces. Commercial grade monitors and mobile collaborative technology will be available throughout the library's first floor study spaces. All floors of the Odegaard Undergraduate Library re-opened June 24, 2013, signalling the end of the first phase of the Odegaard renewal project. We are hopeful that our students and other members of the university community will enjoy a renewed Odegaard!